When I was 16, I moved to Middlesbrough on my own – since then, I don’t really know anyone in Barrow. I first started working with St Mary’s Hospice when I was around 19, and had just come back from my year abroad and found myself with an empty summer ahead of me. I was looking for some CV-fodder and thought that volunteering would at least get me out of the house. It was a bit daunting at first because I didn’t know anybody, but I came in twice a week throughout the whole summer and ended up loving it. Volunteering forced me to get up and get dressed on rainy days, and made me talk to people that weren’t my mum and my dog – since once I’m out of my uni circle of friends, I tend to become a bit of a hermit. Aside from how it benefitted me personally, I could feel good knowing that I was helping the local community. Whenever I am in Barrow during the Christmas and summer holidays, I always come in and ask if they need any help. Even though I can’t commit five days a week for years on end, I can see with my own eyes, how just a few hours here and there whenever I can fit it in really benefits the shop. It’s also a great way to meet and get to know new people from different generations that I wouldn’t really get the opportunity to know otherwise. I always feel really cheerful when I leave at the end of my session. Barrow can be a bit depressing, but helping the hospice and chatting away to other volunteers while we work can be really, really lovely. I’d recommend to anyone with a few hours to spare a week to come in. Worst case scenario – no one’s forcing you to go, so you can stop. Best case scenario – you can help the community, make some great new friends, have an amazing new “volunteering” section on your CV, develop tangible retail experience, learn about stock rotation, and how to use a till. The list goes on! So Friday night I took the proverbial bull by it’s horns and attacked the Barrow shop window…in a non violent creative way of course! For a first attempt I’m okay with it…I think it conveys the message I was trying to put out! The funny thing is…after all of these years trying to avoid window dressing…I actually found the process rather enjoyable…so much so that before I realised…it was 10pm and I was in desperate need of a cuppa! The moral of this story…don’t knock it until you’ve tried it…a bit like volunteering really! For volunteer opportunities in our shops…call in…call up or catch up with us on Facebook…couldn’t be easier. 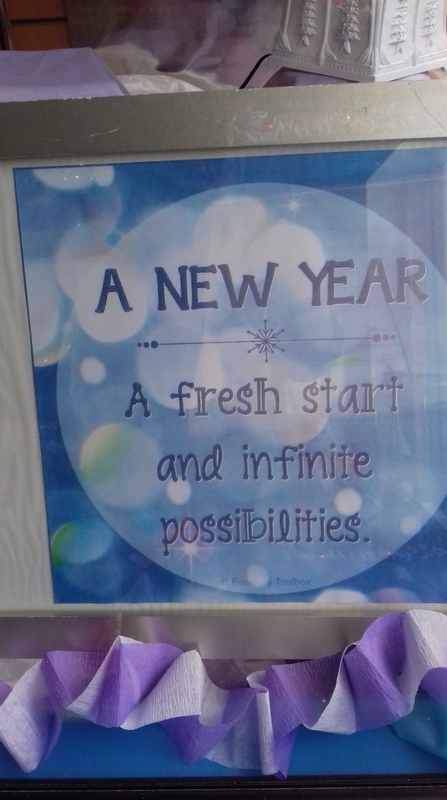 A New Year…A Fresh Start…And Infinite Possibilities! Less than two weeks left in 2017…I don’t know about you but at this time my thoughts often turn to the coming year and the opportunities it might bring. If you hope to make a change in 2018 why not try something different…if you’ve never volunteered in a charity shop before maybe 2018 is the time! You don’t need particular skills or experience…we can teach you that…but if you enjoy working in environments where you feel valued…needed…accepted then we have a place for you. You can call into any of our shops today and ask about volunteering. I see a potential volunteer…don’t delay…pop in…make that call…leave us a message on Facebook…you won’t regret it! As well as being the time for family…friends and Christmas festivities…December is often the month where people decide to have a really good clear out before the holidays end. So…if between Christmas and New Year you are looking for somewhere to drop off unwanted gifts…clothes you no longer wear…DVD’s you no longer watch…then pop along to your local St Mary’s Hospice shop…we’d be happy to accept your donations! All of our shops will display their individual opening times for the week in between Christmas and New Year…these might differ slightly town to town…if in doubt give the shop a ring before you pop down. Don’t forget of course…while you’re dropping off your donations you might as well take the opportunity to check out the shop floor…plenty of bargains to be had and plenty of space at home now you’ve had that clear out! #GoodCauseSantaClaus…what a great idea…if you haven’t completed your Christmas shopping yet…or still have a secret santa gift to buy why not follow the wonderful example of the Charity Retail Association and buy from your local charity shop. Could you and your company do your Secret Santa buying in charity shops? The UK’s “Secret Santas” are being encouraged to make sure their gift buying spreads even more Christmas joy this year by choosing to shop only in charity shops. The price of the gift is usually limited to increase the challenge, and the Charity Retail Association – who represent charity shops across the UK – are now suggesting that players go one further and limit their gift buying to charity shops only. This would raise much needed additional funds for charities in the run up to Christmas. Robin Osterley, Chief Executive of the Charity Retail Association, said: “Christmas should be a time of thinking of others, and every time someone shops in a charity shop they are not only getting a bargain, but also donating to charity and promoting re-use and recycling. I may be a little biased but I think our St Mary’s Hospice shops are awesome places to do your Christmas shopping…the choice is amazing and value for money is a sure thing! Buying a gift from a charity shop has that feel good factor to it…I’m already an avid charity shop shopper but if I wasn’t I would jump on this idea like a shot! I mean…what’s not to like…a gift at a reasonable price and you’re helping a charity raise much needed funds…it makes sense to me! What do you think? Have you bought any gifts from one of our shops? How would you feel receiving a gift from a charity shop…would you see it as a bonus for you and the charity?